The South African labour market is more favourable to men than it is to women and men are more likely to be in paid employment than women, regardless of race. 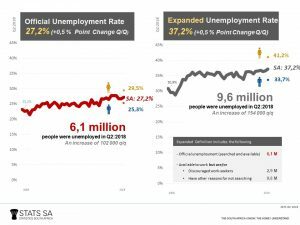 According to the Quarterly Labour Force Survey released by Statistics South Africa, the official unemployment rate has been relatively high since 2008. In the last decade, the rate has increased from 23,2% in the first quarter of 2008 to 27,2% in the second quarter of 2018. 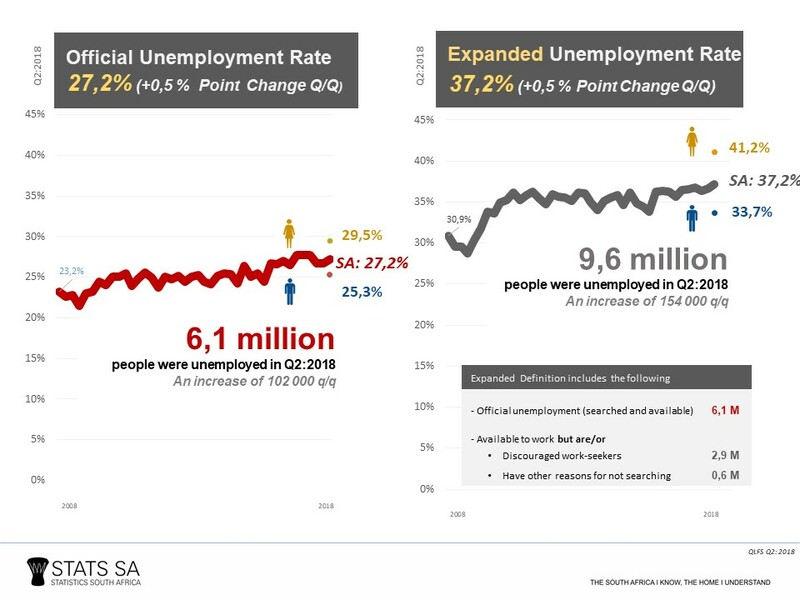 The expanded unemployment rate, which does not take the job search into account, was even higher and increased from 30,9% in 2008 to 37,2% in 2018. Throughout this period, both of these rates were higher amongst women than men. The rate of unemployment amongst women was 29,5% in the second quarter of 2018 compared with 25,3% amongst men, according to the official definition of unemployment. According to the expanded definition, the rate of unemployment amongst women was 7,5 percentage points higher than that of males. As we approach Women’s Month, it is important to celebrate what women have achieved since 9 August 1956, when more than 20 000 women marched to the Union Buildings in protest against the unjust pass laws imposed on women in South Africa. Even though women are far better off today, it is important to know if they are making inroads towards furthering their careers. Women accounted for 43,8% of total employment in the second quarter of 2018. 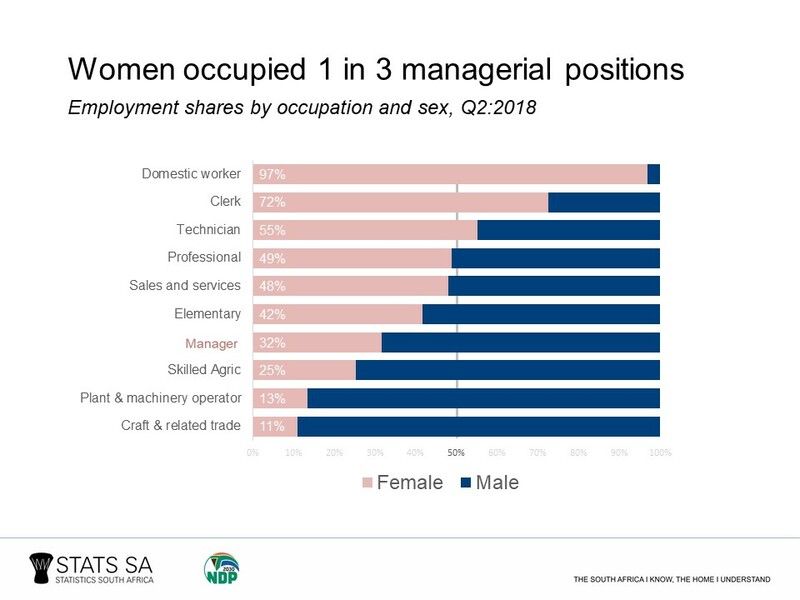 Only 32% of managers in South Africa were women. Women dominated the Domestic worker and Clerk or Technician occupations, with men dominating the rest. Only 3,0% of Domestic worker jobs were occupied by men while 10,9% of Craft and related trade jobs were occupied by women. The informal sector, which accounts for 17,4% of total employment, plays an important role in providing employment to those who cannot find work. Informal sector employment is mainly concentrated in Trade. There are more women than men employed in the informal sector Trade (47,6% of women compared to 30,6% of men). Just under a third of women were employed in the informal sector Community, social and personal services in the second quarter of 2018 compared to 9,6% of men during this period. Men were more likely to work in the informal sector Construction and Transport industries than women. Women are more likely than men to be involved in unpaid work. In the second quarter of 2018, about 55,2% of those involved in non-market activities were women. This proportion decreased by 7,5 percentage points from 62,7% in the first quarter of 2008 on account of an increase in the number of men involved in non-market activities in the second quarter of 2018. The labour market position of women hasn’t changed much over the last decade; in fact, it has deteriorated in some respects.